If you are planning a holiday where you can enjoy yourself, the island, exclusive services and unlimited experiences, you are looking for a hotel for adults in Mallorca. Like family tourism, adult tourism alone has been gaining prominence in recent years. The best hotels in Mallorca are waiting for you, discover them with MLL Hotels. Why an adults only hotel in Mallorca? Because you deserve a getaway where you only have to worry about enjoying yourself. Book your stay in a hotel only for adults and enjoy an oasis of peace and quiet, an exclusive hotel where you can be part of the lively atmosphere that floods and lives on the island. Adult-only hotels are perfect for traveling with friends or in pairs. If you are traveling in pairs, this type of hotel is, without a doubt, a perfect option to live an unforgettable experience with the best company. After a day of sun and sand, a trip to the charming inland villages of the island or a boat trip with your partner, what better way to get to a hotel designed and designed for you. The perfect finishing touch for a day with your partner in Mallorca. If you're traveling with friends, what better way to find your perfect ally for a limitless vacation than with a hotel in El Arenal? This elegant, all-inclusive hotel has a privileged location and offers endless services, shows, entertainment and facilities that will make your dream vacation come true. 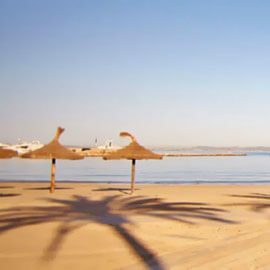 Playa de Palma offers all its visitors an immense cultural offer in its vicinity, shops, front line restaurants with sea views, hotels in Playa de Palma, sports activities, excursions, water sports and much more. After spending a day on its magnificent beach, walking along the promenade, relaxing on the sand or in one of the many beach lounges that give life to this impressive beach, you will still have many things to do and discover in this wonderful area. After a day full of emotions, we advise you to see the sunset from the beach or the beautiful viewpoints that the island has. That's why, in Playa de Palma, you can live both day and night. In the last hours of the day, you cannot miss the sunsets on the beach, the terraces, discos and pubs that fill the Mallorcan night with light and colour. From the MLL Mediterranean Bay Hotel, in addition to enjoying this magnificent area, its beach and restaurants overlooking the sea, you can discover the secrets of the island. 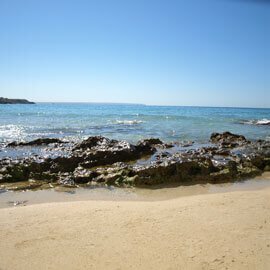 Thanks to its location, you will be able to visit the most emblematic points of the island, take a tour of the most beautiful coves of Mallorca, stroll through the beautiful streets that follow one another in the inland villages, and approach the capital whenever you want and, of course, let yourself be surprised by the most atmospheric areas of El Arenal. 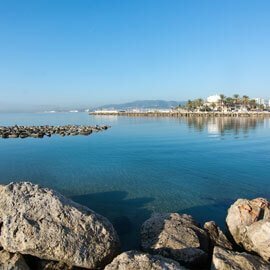 Our adult-only hotel is located just 100 metres from Palma beach and less than a 10 minute drive from the centre of Palma, ideal location or not? Not only that, this hotel, which is included for adults in El Arenal, is equipped with a lounge bar, jacuzzi, sauna and restaurant with showcooking. Discover MLL Mediterranean Bay, more than a hotel, an experience for all 5 senses. With a varied gastronomic offer, in which you can enjoy the "all-inclusive" diet as well as discover the flavours of the Mediterranean diet and the most traditional dishes of the Mallorcan paradise. Its rooms combine design and comfort to perfection. The environment offers harmony and tranquility that make the perfect blend to make your holiday in Mallorca an unforgettable experience. S'Arenal has become one of the most lively and popular areas of Playa de Palma. This old fishing village has become one of the most lively areas of Mallorca. The area is ideal for leisure, sport and relaxation activities and to enjoy a holiday to the fullest. Do not hesitate to book your hotel adults only in S' Arenal, and enjoy a perfect holiday with the best of companies and discover the sea of possibilities that this beautiful tourist destination has reserved for you. One of the main attractions is the marina of S'Arenal which, together with its beach, terraces, discotheques, cafés, modern restaurants and mini-golfs make S'Arenal a perfect area to spend the day, and the night, of course. Its proximity to Palma and the airport makes it an ideal place for tourists and residents alike. In its white sandy beach and its immense promenades, every summer a great multitude of tourists come together, giving life to both the day and the night in S'Arenal. Discover Mediterranean Bay Hotel, a hotel that takes care of every detail to offer its guests more than just a hotel, a little piece of paradise. ¿What to do in El Arenal?